American fashion designer Anne Klein delivers understated, contemporary timekeeping with this chic rose gold-plated bracelet watch. Indulge in irresistible warmth with this sophisticated timepiece, with a delicate diamond at 12 o'clock to add a touch of luxury. 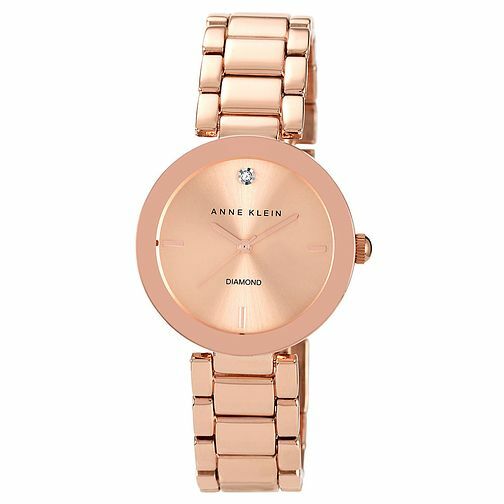 Anne Klein Ladies' Diamond Rose Gold-Plated Bracelet Watch is rated 3.5 out of 5 by 2. Rated 2 out of 5 by Anonymous from Lovely watch This watch is not for a bigger person , watch strap is not very big and no additional links can be added . Disappointed.